From one coffee fiend to another, the idea of going without a barista made latte of a morning is hard to bear. However, if you are adventurous, there are several other interesting ways you can get your coffee fix on your bareboating holiday in the Whitsundays. Firstly, every boat has a plunger and a stovetop Italian espresso machine (aka “moka pot”). Every Whitsunday Escape bareboat has a plunger on board. If you buy the right coffee grounds you can enjoy a deliciously brewed plunger coffee every morning. What to buy: coarsely ground beans, not finely ground espresso beans. 1. Preheat your cup and plunger with hot boiled water. 2. Add to the plunger one rounded tablespoon of coarsely ground coffee per cup. 3. Add the required number of cups of freshly boiled water. Gently stir to mix the grounds, then replace the lid. Be careful not to chip the glass when stirring. 4. Good fresh coffee will create a slightly creamy look, as carbon dioxide is released. 5. Wait no more than a few minutes, then depress the plunger slowly to avoid spillage, and to keep all the coffee below the mesh. It is safest to place the plunger on a non-slip surface. As with filter coffee, plunger coffee brewing reveals the delicate taste nuances that espresso brewing may overpower. Serve immediately – as the coffee will grow bitter if left too long in the plunger. For the perfect water temperature, bring the water to a boil, and let it cool a few seconds. Every Whitsunday Escape bareboat has a moka pot on board. For those who like their coffee a little more serious, this is the way to go. These 6 shot pots can deliver 3 double espressos, or more than 6 mild morning coffees, mixed with extra hot water of milk. What to buy: finely ground espresso beans. 3. 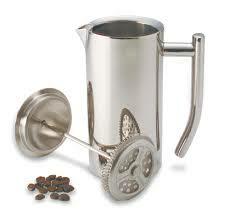 Place the basket into the bottom part of the machine and fill with finely ground coffee beans. It should be full, slightly mounded, and then level it off with a finger, making sure no grounds remain around the lip. 4. Screw the top and bottom together. 5. Place on the stove top over a moderate heat, keeping the handle away from the heat, and leaving the lid open. 6. Coffee will start to come out of the internal spout. It will make a puffing sound and a brown stream of coffee that will slowly get lighter in colour will come out. Once it is the colour of yellow honey, remove from stove with caution (use a tea towel or oven mitt) and close the lid. 7. Run the bottom section under cold water to stop further extraction. This will prevent a metallic taste from developing. 8. Once the coffee has stopped bubbling out of the internal spout, you can serve. Add hot water or milk for a milder coffee. With a huge variety of coffee sachets on the market these days, there are a multitude of delicious choices to try out. From mild to strong, flavoured, sweetened, even decaf, there are several brands of coffee sachets that are worth a look-in for an easy morning coffee fix. Don’t cringe! If you buy a high quality instant coffee, and prepare it correctly, instant can pass muster for a week of holidays. The secret to preparing instant coffee? Mix your instant coffee with a little cold milk or water first. Boil your kettle and let it sit for a minute before pouring into your milky/watery coffee mixture. Boiling hot water will scald instant coffee giving it a bitter taste. Pro tip: you could mix your coffee with some pre-boiled milk. Use a saucepan to bring milk to the boil, then replace hot water with milk for an even better latte experience.